A bomb has driven worshipers from their churches and homes on Christmas. Ironically, this did not transpire in lands where war currently rages. Instead, it was a British bomb intended to end German lives. Perhaps you’ve already seen the story? The weapon was huge, nearly two tons in weight, and it’s explosion would have been no less lethal today than when it was originally dropped. The bomb, known as a blockbuster, was the largest of its kind dropped by the RAF during aerial attacks on Germany in the second world war. It weighs 1.8 tonnes and, if exploded, could damage all buildings within a one-mile radius. As I have worshipped and reflected during this Christmas season, the story of this bomb has continued to intrude on my thoughts. 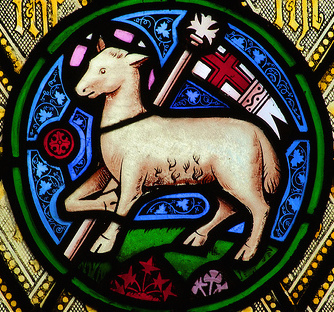 On that first Christmas night a group of shepherds heard music that has now echoed for millennia. God’s call to peace on earth and his desire for good will among his children—gifts already given to the world in the birth of Jesus—cannot be negated by the weapons of man. As C.S. Lewis wrote, “Once in our world, a stable had something in it that was bigger than our whole world” (The Last Battle). Still, in this moment, when this long forgotten and deeply buried blockbuster bomb can disrupt the traditional Christmas schedule, we see a vivid contrast between the good God desires for us and the ill we too often bear for one another? The entire world is aware of the genocide of Christians and Yazidis being conducted in the Middle East by Jihadists. This Christmas, however, marked a moment of encouragement. Two years after being driven from their city by the Islamic State, Christians were able to return to the recently liberated city of Qaraqosh to worship God. The church structure had been desecrated, but the presence of God among his gathered people, has reconsecrated it. Despite the hatred some people hold for others, and the violence they inflict, it is encouraging to recognize that no power in this world can defeat the miracle that transpired on that first Christmas Day. Are souvenir socks a good way of celebrating one of the move pivotal points in human history? That’s right, stockings. 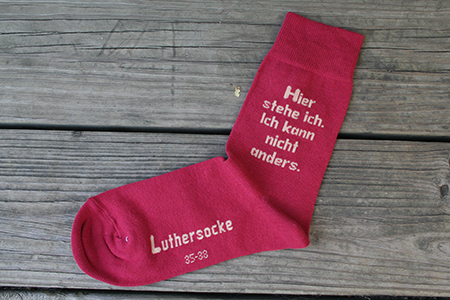 Socks emblazoned with one of the most famous statements of Christian faith made during the past millennium. “Hier stehe ich!” “Here I stand” (on the clear message of God’s word). This was Martin Luther’s steadfast defense where his salvation on the teaching that we are saved by God’s grace and mercy, not by our own efforts. “Ich kann nicht anders.” I can do no other, Luther continued. He invited his adversaries to correct him if they could show him in error, according to the Scriptures. We are beginning a season when many people are celebrating the 500th anniversary of the Reformation of the Church. Some of the commemorations are quite noteworthy. Others . . . less so. On the positive side, I rank near the top The Wittenberg Project, the restoration of the Old Latin School in the city where Luther preached the Gospel. I condemn it on the following grounds. . . . Things are given as presents which no mortal ever bought for himself – gaudy and useless gadgets, ‘novelties’ because no one was ever fool enough to make their like before. Have we really no better use for materials and for human skill and time than to spend them on all this rubbish? The problem with religious kitsch is that its cuteness and self-gratifying nature can domesticate and thereby distort Biblical faith. Christianity is not a sickly, sweet religion . . . The anemic figurines of Jesus Christ are poor testimony to His deity and His lordship. While surfing the net researching this peculiar item, I encountered an entertaining website where we see how the Catholic—Reformer struggle lives on today. With all due apologies to my Lutheran brothers and sisters: while this catapults you into a real race with the Catholics for kitsch, we will crush you like grapes in this arena. It’s all good-natured, of course. I haven’t bothered to research Catholic variations on the footings quotations front, but I imagine they are equally pithy. I did, however, find one prolific Roman Catholic author whose following statement might be just as suitable for a hat as for stockings. 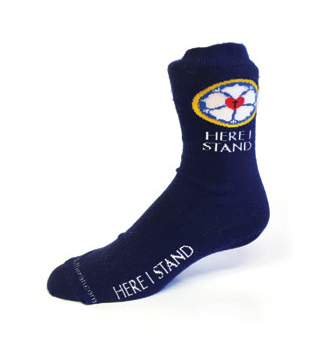 * You can order your own pair of “Here I Stand” socks here. ** The Ironic Catholic post is here. One of the sad things about living in a secular nation is that people understand very little about the real meaning of Christmas. For example, many people take their trees down on 26 December, mistakenly thinking Christmas is “over.” In reality, the Christian celebration of the Nativity of Jesus only begins on Christmas Day! The commercial world celebrates the season of Advent and deceptively calls it “Christmas.” These weeks, which should mark a spiritual preparation akin to Lent, are instead transformed into a frantic race to accumulate the perfect gifts to show others just how much we value each of them. And, since we love our family and close friends, there is a constant temptation to be far more extravagant in our gift giving than we can afford. Returning to the season of Christmas, in which we find ourselves this day . . . we discover a brief occasion to focus our spiritual reflections on the singular Christmas miracle, the Incarnation. God becoming a human being. The Word through whom all things were created, becoming a mortal like the sons of Adam and daughters of Eve fashioned in his own likeness. Christmas is, indeed, a glorious season. One of the great literary treasures of the world is a precious book written before the year Anno Domini 318. Athanasius of Alexandria wrote a treatise called “On the Incarnation,” which makes great reading and is readily available online. A fairly modern translation was written by Sister Penelope Lawson, an Anglican nun. Every age has its own outlook. It is specially good at seeing certain truths and specially liable to make certain mistakes. We all, therefore, need the books that will correct the characteristic mistakes of our own period. And that means the old books. All contemporary writers share to some extent the contemporary outlook—even those, like myself, who seem most opposed to it. Nothing strikes me more when I read the controversies of past ages than the fact that both sides were usually assuming without question a good deal which we should now absolutely deny. They thought that they were as completely opposed as two sides could be, but in fact they were all the time secretly united—united with each other and against earlier and later ages—by a great mass of common assumptions. You must understand why it is that the Word of the Father, so great and so high, has been made manifest in bodily form. He has not assumed a body as proper to His own nature, far from it, for as the Word He is without body. He has been manifested in a human body for this reason only, out of the love and goodness of His Father, for the salvation of us men. We will begin, then, with the creation of the world and with God its Maker, for the first fact that you must grasp is this: the renewal of creation has been wrought by the Self-same Word Who made it in the beginning. There is thus no inconsistency between creation and salvation for the One Father has employed the same Agent for both works, effecting the salvation of the world through the same Word Who made it in the beginning. You can read the entire work at this site. Have a blessed Christmas season!